"I'm not a cerebral guy," says Yann Tiersen. "When I record a song, I like to capture what's going on straight away. I don't make demos: I find it's impossible to redo something with the same energy, the same feel you had when you were inventing it. I try to retain these unique moments in the final version. A song often loses its soul when you try to refine it, to redo it well. I keep the first draft, and I only develop one version of a given song at a time. "A song can come out of a four-minute-long guitar track where I'm just repeating the same chords; I find a bass line, then the other parts come, and the song is born. But in the final mix, that first guitar part will still be there, even if it's barely audible. Starting from a little idea like that, you have almost total freedom to build the song. The more dumb and basic the idea is, the more wild and original the song can become." At the age of 35, Yann Tiersen is one of the most famous French recording artists. His latest album, Les Retrouvailles ('Reunion'), has already sold several hundred thousand copies throughout Europe. What makes this surprising is that Tiersen's style is rather marginal in today's musical world, containing no electronics, no samples, no machines and no MIDI. He plays most of the instruments himself, recording them live with almost no editing or plug-ins. Tiersen plays mainly instrumental and short songs, employs delicate and rare musical instruments, adds evocative and almost childish noises (bicycle, toy piano, music box, recorder, even a typewriter) and combines them with 'normal' rock & roll instruments. 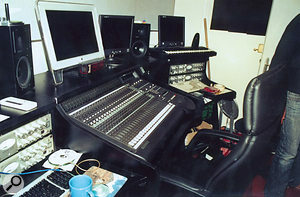 However, Tiersen is no Luddite: he writes and records his music in his own studio, uses modern production tools like Logic Audio and Pro Tools, and mixed the latest album on an SSL 9080K at Davout Studios in Paris, while its release was accompanied by a 'making of' DVD in 5.1 surround. 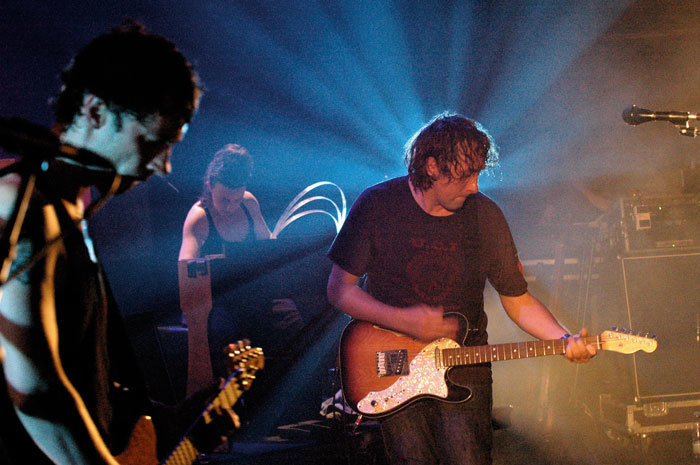 As a teenager in the '80s, the classically trained Yann Tiersen felt more attracted by rock & roll, and put down his instruments to play electric guitar. His first album, La Valse Des Monstres ('Monsters' Waltz', 1995), was a compilation of themes written for theatre and animated movies. In it, Tiersen's musical style arrived fully formed. He recorded it himself with an ADAT, a few budget microphones and an analogue console. A year later, on Rue Des Cascades ('Cascades' Street'), Tiersen progressed: his string arrangements, which he played himself, were richer, the melodies more developed, while follow-up Le Phare ('Lighthouse') reached a wider audience and saw Tiersen singing for the first time, along with guests such as Claire Pichet and Dominique A, and touring France. 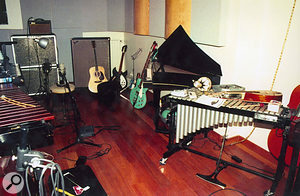 His 2000 album L'Absente ('Missing') brought in new sounds like the Ondes Martenot (see box), a string quartet, an orchestral ensemble, well known English singers such as Lisa Germano and Neil Hannon, and a new sound engineer, Fabrice Laureau. Photo: Richard DumasWhile working on this ambitious project, Yann got a phone call from French film director Jean-Pierre Jeunet, then shooting Le Fabuleux Destin d'Amélie Poulain. Jeunet loved Tiersen's records and had already put some songs on his rushes as temp tracks. He asked Tiersen to write some original themes for the film. "I met him, saw some sequences edited with my music, and I was amazed — it worked pretty well!" says Tiersen. "I agreed to write some more songs, even though I only had 10 days to do so." Four new songs were on the movie soundtrack, among them the famous 'Valse d'Amélie' ('Amélie's Waltz'). All the other songs came from Tiersen's previous albums, mainly the second one: a sort of 'best of Tiersen according to Jeunet'. Tiersen's music played a huge role in Amélie, and went a long way to create its touching and very personal atmosphere. The film, and accompanying album, became an incredible success, with Tiersen's newfound fame allowing him to fill big halls with enthusiastic audiences... who kept on asking him to play little waltzes on the accordion! He recorded a double live album at the Cité de la Musique de Paris, with the Synaxis ensemble, and in 2003, composed his first original soundtrack, for German movie Goodbye Lenin. Les Retrouvailles, his first solo album for four years, was released in France in May 2005. Like Le Phare, Les Retrouvailles was recorded on the island of Quessant off the coast of Brittany. Tiersen brought some instruments with him, and a mobile home studio: his condenser microphones (now Neumanns! ), his Powerbook running Logic, a Digidesign M Box interface and a pair of loudspeakers. His girlfriend Aurélie du Boys came with him, to shoot the DVD that shows the making of the album. Photo: Richard Dumas"During several months, I recorded some basic elements, when they came, on guitar, piano, violin... Then Fabrice arrived here, and I presented him all these bits and pieces." Fabrice Laureau takes up the story: "When I arrived in Quessant in June, Yann had recorded around 30 songs with two or three instruments. He knows how to record and set up the gain structure, but does not always place the microphones at the right distance. As I listened to these ideas, I gave him my opinion: I had neutral and fresh ears. I cut some parts and we added some instruments on some songs, with a close and a distant mic. Sometimes, I EQ'ed or I compressed directly. It was the first time I had ever used the Avalon VT737, and I loved it. Yann had brought his mandolin, a Pleyel piano, his violins, and several electric guitars with a little good-sounding Fender Champ amplifier." At this stage, all these songs were only fragments, but the finished CD includes a track entirely recorded at Quessant, '7pm'. "I like to include a solo violin piece on every album," explains Tiersen. "Even if it's rough, I like that. But this time, I had nothing. I tried a waltz idea, and even developed a few versions of it — I never usually work like that — but nothing came. Then Fabrice and I had the idea of recording in a little church on the island. It had a very distinctive natural acoustic, with a deep, bass reverb. It kind of inspired me." Fabrice explains the song's title: "We arranged with the vicar to have the church from six to 10 pm. We arrived, we installed the gear, Yann warmed up, and as soon as I hit Record, the bells started ringing seven o'clock. We had never thought of that! Yann kept on playing and I kept on recording. He was focused on what he was playing, the moment and the ambience inspired him, and his take was superb: he never got it better afterwards. We listened back and it was perfect. A first take, and the bells bring a lot to the song's atmosphere." Featured on the Les Retrouvailles album and much more on the DVD La Traversée and on stage, the Ondes Martenot was one of the first electronic music instruments. It was invented by Frenchman Maurice Martenot in 1928, and inspired many classical composers from that era, including Darius Milhaud, Olivier Messiaen (whose sister-in-law, Jeanne Loriod, was a virtuoso on the instrument), André Jolivet and Arthur Honegger. The Ondes Martenot appears on some famous songs too, by Jacques Brel for example ('Les Vieux' and 'Le Plat Pays'), and in the music for films from Mad Max 3 to Mars Attacks, where its mystery is perfect for highlighting dramatic tension. The instrument has a miniature piano keyboard which is vibrato-sensitive, but it also allows the user to control the notes by sliding a ring along a metal ribbon. By changing the built-in speaker, the player can modifiy the sound signature to make it metallic or resonant in the same way that a guitar player changes his sound by using a certain type of amplifier, and a 'timbre drawer' makes it possible to change the sound's character in the same way you would edit a synth preset. Yann Tiersen has used the Ondes Martenot extensively on stage since 2001, but he lets the French virtuoso Christine Ott play it. "I always loved the instrument after I discovered in Messiaen's music," says Tiersen. Yann, Fabrice and Aurélie then returned to Paris, where Yann has a studio in the basement of his house, and worked solidly for four months. "We worked song by song. I went downstairs, I played, I looked for ideas on this or this instrument, Fabrice recorded them and we listened to the results. If it was good, we kept on working in that direction; if not, we changed our perspective. We can both be stubborn sometimes, but we often agree. That's why we work together!" "In his studio, Yann has everything at hand: his keyboards, his amplifiers, and all the childish music instruments he has collected — from a toy piano to the 'Romanian duck'!" explains Fabrice. "It's his world. We sometimes had around 100 tracks playing in Logic. You have to take care and to use good gear to avoid hiss." The number of tracks is needed because Yann often records all the elements that make up a string arrangement himself, one at a time. On his first albums, he was forced to do this for budgetary reasons, and it became part of his style. Most of the string sections we can hear on Les Retrouvailles were recorded this way, and they have a distinctive feeling. "When I recorded Goodbye Lenin, I discovered that when you have parts played by a real orchestra, there is inertia. An orchestra is an ensemble of people, and you can't ask 40 people to be completely involved in a track. That's why sometimes, I prefer to record myself on 40 tracks! I'm not at all disappointed with orchestras, but when I do it myself, the results often suit me better." 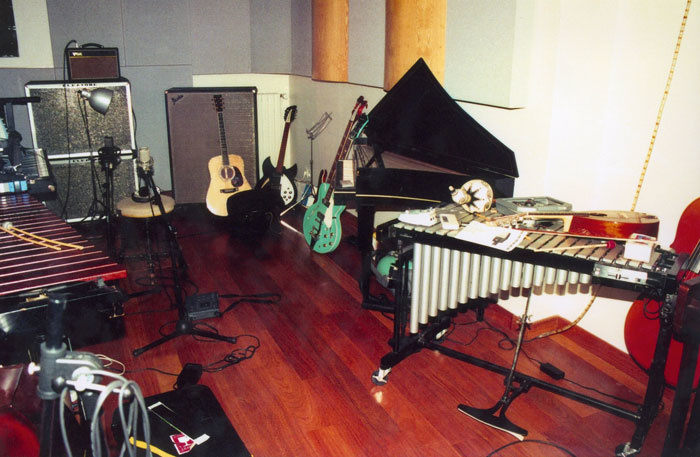 The live area in Yann Tiersen's new studio, with his array of classical and not-so-classical instruments.Photo: Richard Dumas Asked if he bought any new gear to record his latest album, Yann Tiersen answers "Nothing, except this studio!" Until 2003, he lived in a three-room flat in Paris, with a room for his sound gear, the harpsichord and some other instruments in the living room, the microphones in his bedroom... Yann then found an interesting building a few hundred metres away: he bought it and made extensive alterations, even digging under the foundations, to create his personal studio. Around 4 x 7 metres in size and 5m high, it's acoustically treated and houses his entire collection of musical instruments: harpsichord, spinet, Rhodes piano, mandolin, violins, guitars and amplifiers, lots of percussion and toy instruments. 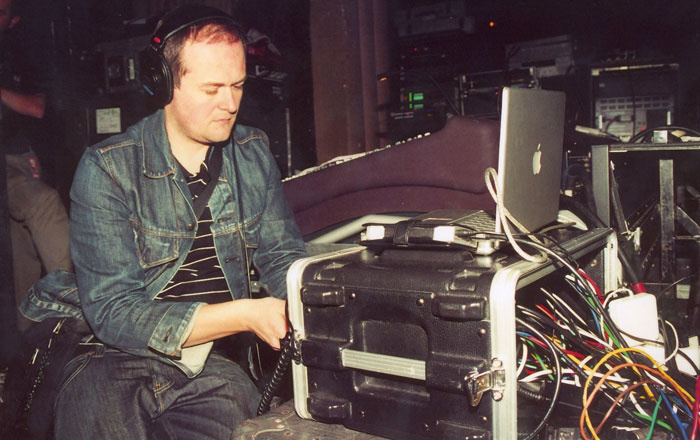 "I record downstairs, on Logic or Pro Tools, with my Powerbook and my M Box. I'm no expert in software or plug-ins. That's more Fabrice's domain. When he comes here, Fabrice connects his RME interfaces to the control room's dedicated computer and Mackie D8B digital console. I once mixed a lot using the Mackie, but nowadays, I just use its monitoring section, its converters and its digital clock. It's a lot easier for me to mix in Logic." Yann uses four Avalon VT737, Joemeek and TL Audio preamps, plus Teletronix LA2A and Urei 1176 compressors. He still uses the Oktava condenser microphones he employed on his first album, although he has since bought an AKG C414 and some Neumanns. In Aurélie's DVD, entitled La Traversée, several sequences show the songs building progressively, but there's no foolproof method at work. "When Yann begins to stack tracks, he reacts to proposals, remarks, ideas," says Fabrice. "Sometimes it's 'Yes', sometimes it's 'No', and sometimes it's 'What about adding this or this?' It doesn't work every time: when we listen again to the track the following day, we realise we were wrong. But he's got an incredible ear, he knows what instrument to add, and all these stacked sounds never become confused or blurred, but enlighten each other. There's no routine involved, no after-the-melodica-let's-play-piano! From time to time, I'll modify the parameters on his guitar amp for more crunch or less fuzz, or I'll put a microphone further away, or if he plays bass I'll add mid and dampen the attack. Yann excels in playing all those little notes that can seem insignificant, but which build the atmosphere of the whole song." 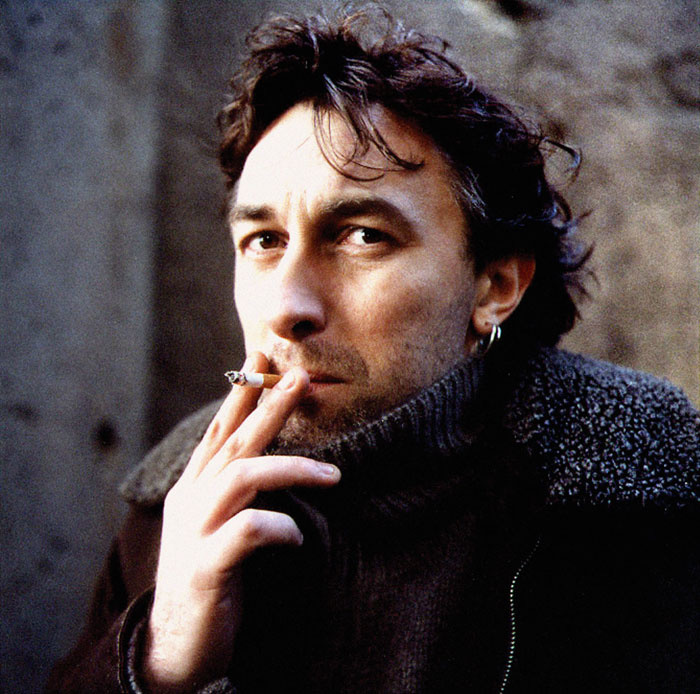 "Except on 'La Boulange', I played the drums on the record myself," explains Yann Tiersen, "and I'm a really bad drummer. I can't make the snare or the kick sound right, so on one song I had the idea of putting my banjo on the snare and hitting my 'cello to mimic the kick. I got a pleasing and personal result, and my drums have the right sound, because I made the sound with what I could do. That's because I can't play: I didn't get what I wanted, so I got other ideas, and accidents helped me to go forward. The song is much better with my 'drums' than it would have been with a real drummer. "Limits can help you to go further. I'd even say it's terrible to know how to play everything on a musical instrument. I play piano and violin well, but to be able to rediscover them I need to not play them for a while. These days, I have rediscovered guitars. The most important thing is to keep fresh. When I pick up an instrument, if I have already heard what comes to me 10 times before, I give up and choose another one. "I can't play the musical saw properly, for example, but I use it nevertheless — I find it's a very evocative sound. It's the same with the trumpet: you can see me try to play one in the DVD, and I had even recorded a song with a trumpet on L'Absente, but I didn't keep it. I love to improvise when I work on a song. Accidents will happen, but I need that in order to go forward, and sometimes, the song comes from an accident. "It's the same on stage. I love playing with [guitarist] Marc Sense because nothing's ever fixed with him. He wants to use a drill on a song? Fine with me, no problem, I love that. As long as it doesn't become systematic, using unsual instruments helps me to go forward." Fabrice Lareau, Yann's engineer, with the mobile rig he's using to record Tiersen's latest tour.Photo: Richard Dumas Fabrice Laureau, aka f.lor, has been Yann Tiersen's sound engineer and co-producer since 1999. He's a musician too (he plays bass, but only on his own projects), and a mastering engineer. He was born the same year as Tiersen, and his career is very atypical. Instead of studying audio engineering or becoming an assistant, he got a Ph.D in wave physics. As he didn't want to become a researcher, he quit to go on tour with his band. "I then evolved from musician to sound engineer, but I don't consider myself a 'real' sound engineer, although I have already recorded around 30 CDs. I've worked in a lot of studios, big ones and small ones, in analogue and in digital, but I don't really have a favourite studio. I know how to use a console, a microphone or a recorder, but I wouldn't be able to modify a mixer channel or outboard processors. I like the sound that engineers like Steve Albini or Mario Caldato [who works with the Beastie Boys] get, where you can 'hear the room' on the record. I love this kind of ambience; I use few artificial reverbs, and most often it's a plate reverb. I don't pretend to know the whole truth in the domain, but to my ears a plate reverb fits into my mixes better than a Room preset, for example." 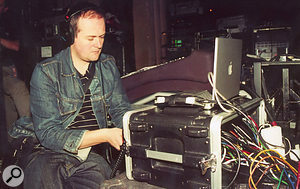 Ten years ago, Fabrice created the Prohibited Records label with his brother Nicolas, and produced bands in Black Box Studios, in London. "I liked the results, but sometimes, it didn't sound exactly like I wanted. As we had an eight-track tape recorder, we recorded our own band, NLF Trio, with my brother and Ludovic Morillon [now Yann Tiersen's tour drummer], in our rehearsal room. Some people asked who had recorded it, called me, my name became known, and I ended up recording [French singer] Françoiz Breut's album, Vingt à Trente Mille Jours. That's how I met Yann — he wrote some arrangements on that album — and Dominique A, who asked me to do some mastering on a compilation box of his songs." After four months of hard work at home, Yann Tiersen and Fabrice Laureau booked a month at Davout Studios, a top independent studio in Paris which celebrated its 40th birthday last year. Yann wanted to add a conventional string section, a wind section, some piano parts, and record his guest singers. Fabrice enjoyed using the studio's Neumann U47s, tube and FET, and brought with him some Coles 4038 ribbon microphones: "I love them. They have the precision we enjoy on condenser microphones, without agressiveness on transients. I almost don't compress them, and the results I get are splendid." Every day when he arrived, Fabrice transferred the Logic files into Pro Tools before mixing. "I use Pro Tools mainly as a tape recorder. I don't like to edit, I prefer to record things again! I hate to quantise drums or other sounds: doing that to Yann's music kills it instantly. Without time correction, his music lives, charms and touches people — groove comes from these 'imprecisions'! I hate using noise gates too, but I'm very demanding in terms of flat notes or instrument tuning." The mix is mostly fairly intimate in its sound. "I hate endless reverbs," says Fabrice. "I'm more of the Albini school, I like using the sound of the room. Yann's recording area has a pretty high ceiling; there's some ambience if I record distant mics, but to add air, I fed the recorded sounds into Davout's huge Studio A via loudspeakers, and I recorded the ambience. On drums and on orchestras, it's a real luxury. On the album, I mainly used natural studio ambience, plus an EMT plate reverb. I must admit I discovered superb presets on Davout's Lexicon 960L. My secret weapon is the Eventide H3000. Most people know it as an harmoniser, but it houses a lot of interesting small room and ambient reverbs, very short, which allow you to 'unstick' sounds or push them further into the mix." Yann's guest singers were Jane Birkin, Dominique A, Christophe Miossec, Liz Frazer and Stuart A Staples of the Tindersticks. They got a day each. "I invited Liz Fraser to sing on two songs," says Tiersen. "I had written the lyrics for 'Mary', but on 'Kala', I left her to improvise freely. It was incredible: she took her notebook and wrote her own words, in her own language; then she sang, and it was superb. I think there's no one who can be as creative, as inventive, as sensitive. She arrived in the morning, we knew she had to leave at 6pm, and by 2pm, we had recorded nothing! She had written some words on her notebook, but I had not a single sound in the microphone. Then, as you can see in the DVD, she asked me to play the song. Two or three takes later, it was done! A very special moment." During the mix, Fabrice Laureau doesn't recreate dynamics with fader movements: "I write some volume automation in Pro Tools, but I try to get the nuances from the beginning. That's not because I'm lazy — I like it when things go their own way. When I mix, I rarely compress: I prefer limiting." The control room in Tiersen's studio: the Mackie D8b is mainly used for monitoring and clocking these days.Photo: Richard DumasDavout's studio A houses an SSL 9080K console and six Prism ADA8 high-end converters. "I love the 'main' compressors on the 4000 Series, but this aspect has changed completely on the 9000," says Lareau. "I was surprised: globally speaking, the console's sound is a lot clearer. For the first time ever, I didn't recognise what I sent to the console, and I had to cut high-end, almost 3dB at around 7kHz, inserting a GML EQ. That's a lot for me: most of the time, 2 or 3 dB is the maximum, unless I want to 'destroy' a sound or exaggerate an effect." Fabrice had another surprise. He mixed the songs in Pro Tools HD and on half-inch analogue tape, but he didn't expect the results he got. "We wanted to compare the sounds during the mastering phase, and although the tape gave an nice overall effect, it lost a lot of detail compared to the digital mix. On Yann's music, analogue tape didn't work. It would probably have been different on a more rock & roll album, with more energy, but each time we compared them, we heard more detail in digital. We wasted all this analogue tape for nothing!" Fabrice occasionally practices the art of mastering, and he's got strong ideas about it: "I do it at home, in Pyramix or Logic, with T-Racks and a few selected plug-ins — I know my tools well. For me, the mastering stage must produce a more listenable record. It's no use looking for the last dB of gain, just to be louder than the others. For Yann's album, we tried to work with Roger Seibel [SAE Mastering, Arizona] again, as we loved his work on previous albums, but he didn't find the right direction this time. Then we went to Abbey Road, with Chris Blair. We worked together, song by song, and I always understood his settings, even if he doesn't use the same tools as I do. He kept the transparency and added some subjective level, using some old Junger Audio digital compressors. We tried to burnish the brilliance we had already heard during the mix, and Chris added some low end with his vintage EMI console to balance the sound. I'm not the first to notice this brilliance: perhaps it's the Prisms? Anyway, it pleased the classical and film-music engineers who are the main customers of Studio A in Davout." Immediately after the new album's release, Yann Tiersen began an extensive European tour, playing for audiences who still know him above all for Amélie. Fabrice confirms: "In concert, half of the audience are just waiting for Yann to pick up his accordion! On this tour, the ambience is very electric, almost progressive music sometimes. Yann plays rock! The basis of most songs is bass, drums and electric guitar, and even the Ondes Martenot is played through a guitar amplifier. I am following the tour to record some concerts, and Aurélie is shooting everything with her digital video camera. Yann intends to release a DVD about the tour, but with a general ambience like La Traversée — not another concert DVD... At each show, I am recording 26 tracks on site with Logic, my Powerbook and my RME [Octamic] interfaces. It all fits in a little rack!"